Although the Army has actively sought recruits since the days of the Continental Army, it did not establish the U.S. Army Recruiting Command (USAREC) until October 1, 1964. In the early day of USAREC, which was headquartered at Fort Monroe, Virginia and had just 92 total personnel when it opened its doors, recruiting stations were called “rendezvous” and were found only in Baltimore, New York, and Philadelphia. Between 1964 and 1973, USAREC’s headquarters were relocated first to Fox Hill, Virginia, then to Hampton, Virginia (where it was housed in leased office space), and finally to Fort Sheridan, Illinois. As a result of the Base Realignment and Closure process, USAREC moved once again in 1992 to its current location of Fort Knox, Kentucky. 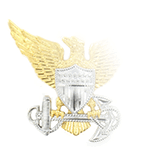 Ten years later, USAREC was reorganized and placed under the U.S. Army Accessions Command, which as a subordinate command of the U.S. Army Training and Doctrine Command was tasked with integrating the command and control of recruiting and recruit training. 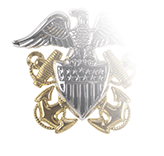 Wear of the U.S. Army Recruiter Badge is not limited to those serving as MOS 79R Recruiters, however. 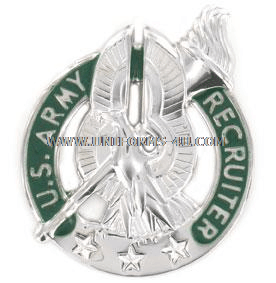 Any member of the Active Army or Reserve Component personnel who is assigned or attached to the USAREC are eligible to wear the badge (regulations also specify the badge may be worn by “military personnel” attached or assigned to USAREC). The Basic Recruiter badge, which is silver, can be issued for wear on a temporary or permanent basis; the Commanding General of USAREC announces which personnel are authorized for temporary wear, while authorization for permanent wear is announced by the Commandant of the Recruiting and Retention School (per the CG of USAREC). 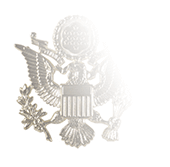 Gold Recruiter badges are issued only on a permanent basis, with authority for permanent wear announced via memorandums issued by one of USAREC’s 45 Battalion Commanders; Master Recruiter badges are authorized by one of the command’s seven Brigade Commanders. 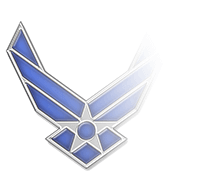 Prior to September 30, 2010, the Basic and Gold Recruiter badges could be awarded with up to three Achievement Stars (gold for Basic, sapphire for Gold) based upon criteria established by the USAREC’s Commanding General. 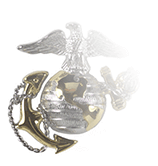 The suspension of the Achievement Stars was followed by the creation of the Master Recruiter Badge some four months later on February 2, 2011.